Limited in-between Capul Midia and Vama Veche, the Romanian Littoral zone of the Black Sea extends on 245 km. Along the European road E87, there are aligned the 15 resorts, offering the tourists over 250,000 accommodations. This is Romanians’ favorite destination for holidays. 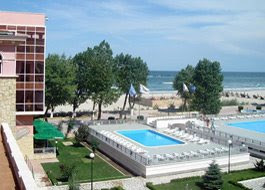 The most important resort is Mamaia, situated north of the city of Constanta, on a strip of land separating the Black Sea from the Siutghiol Lake. 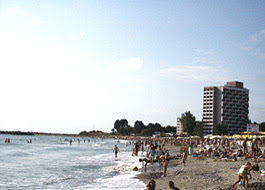 Mamaia is a popular destination during summer time, for Romanians as well as for foreign tourists, as a result of major programs of investment. Other important resorts are: Neptun, Venus, Saturn, Jupiter,Olimp, Eforie. Costinesti is the traditional resort for students, while Vama Veche, at the southern extremity, at the border with Bulgaria, is the place for fishermen, also known for the “hippie” atmosphere. The main cities in the region are: Constanta (the biggest port at the Black Sea), Mangalia and Navodari. .The beach, oriented east and south-east, has a width varying between 150 – 200 m, mostly covered by fine sand. The slope is smooth and easily accessible, the salinity of the sea is reduced and water’s temperature is approximately 24 C degrees during the summer season. The climate is mild thanks to the sea breezes, rich in aerosols which alleviate the heat of summer days. During the season, one can sunbathe 10 – 12 hours a day. The Black Sea is the third in size in Europe, and the second for what concerns its depth. Marine currents are weak and the tide is of approximately 10-20 cm. There lives a species of sharks (Squalus acanthias - “the sea dog”) of small dimensions, but harmless for humans and which does not approach the shore. Moreover, for those who wish to follow medical treatments, there are different balnearic resources with mineral and mineralized waters, therapeutic muds, in the treatment bases near the lakes of Techirghiol, Tatlageac, Neptun, Belona, Siutghiol, Corbu, Sinoe, Navodari and Tasaul. There are multiple possibilities for accommodation, from five stars hotels to boarding houses, campings or even in the houses of the natives. Usually, starting with the 1 of September, prices lower because it’s extraseason. For entertainment, there are numerous bars, discotheques, casinos, one can play bowling or billiards, ping-pong, there are especially designed areas for playing sports like European football, tennis, volleyball, badminton, basketball, and for the most daring there is the possibility of practicing nautical sports.Aqua Magic aquatic park, lying on an area of 27,200 square meters, is located at the entrance of Mamaia and has a capacity of over 2500 visitors. The Casino from Constanta stands for a guide mark on Constanta’s touristic map. It was built in 1909 following the plan of the architect Daniel Renard, and it represents the only element of the “art nouveau” style. 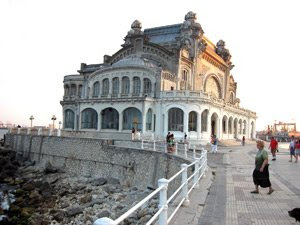 In front of the casino there is the Aquarium from Constanta, inaugurated in 1958 which offers the tourist a fascinating incursion in the sea world. There can be admired different species of fish both of fresh waters and also of salt waters, exotic fish, the thornback ray, the seahorse, the dragonfish, the scorpionfish, a collection of sturgeons, all the species living in the Black Sea being represented, and innumerable species of invertebrates. We mustn’t forget about the Genovese Lighthouse, octagon shaped, 8 meters high, situated on the sea-wall in Constanta, built between 1858 – 1860, in memory of the Genovese merchants. The most important archeological objective is the Citadel of Histria, situated on the shore of Lake Sinoe, an ancient Greek colony, set up 2,600 years ago. Beside that, in Constanta can be found significant vestiges of the ancient city of Tomis, where the poet of Latinity, Ovidiu, spent the last years of his life. An important place is represented by the Roman edifice, with mosaic, an architectural complex that has been discovered and which is considered to be, by the archeologists, among the first of this type in the entire world. Then, at Mangalia, previously called the city of Callatis, it can be found the oldest Latin document in the entire South-Eastern Europe. In the department of Adamclisi, there are the ruins triumphant monument Tropaem Traiani and also the traces of the fortified city Tropaem Traiani, built to honour the emperor Traian, after having conquered Dacia. Among the museistic institutions, we must mention here the Archeological Museum of Mangalia, the History Museum in Constanta, the Folcloric Museum, Biserica Sf. Petru si Pavel (Church Saint Peter and Paul ) in the historical area of the city of Constanta, the Mosque from Constanta, the Mosque from Mangalia, the monasteries Cocos and Cilic-Dere. Other touristic attractions along the littoral are represented by the caves from Cheile Dobrogei and from Limanu, the maritime dunes from Agigea, with the floristic reservation and Hagieni Forest at 15 km from Mangalia, a distinct floristic reservation, unique in Dobrogea. We should also not forget about the well-known vineyard from Murfatlar where they produce the famous and flavored wine bearing the same name, and the vineyard from Sarica Niculitel. In order to reach the Romanian seaside by car, you have at your disposal the Bucharest-Fetesti-Constanta National Road or the European Road E60 Urziceni-Slobozia-Constanta, or the European Road E87 Tulcea-Constanta, with derivation for Braila and Galati, or the National Road Calarasi-Ostrov-Constanta. On the railway, you ca choose direct routes to Constanta from almost any corner of the country. Or, there is the possibility of changing the route in Bucarest. During the season, the numver of trains going to the seaside is increased. In between Constanta and Mangalia, there are train stations and flag stations from where one can reach any of the resorts. This way, from Constanta’s station, one can reach Mamaia and Navodari; the following stations are Agigea, Eforie Nord, Eforie Sud, flag station Tuzla, the station of Costinesti, the flag station Costinesti and the flag station Neptun, in order to reach the resorts Neptun, Olimp, Jupiter, the station of Mangalia for Mangalia, Saturn, Venus, Jupiter, Cap Aurora, Neptun, Olimp, 2 Mai and Vama Veche. For those who want to use air routes, The International Airport “Mihail Kogalniceanu” is situated only approximately 20 km away from Constanta. This airport serves the entire Romanian coast of the Black Sea and it is connected to the main European capitals through charter flights during the summer season.